Great jackpots New players get a chance to spin the 'Wheel of Rizk' - a prize wheel with cash, bonuses and chips up for grabs. Why Play at Rizk Casino? Rizk Casino is a mobile games site with both UK and Malta gaming licenses. It boasts plenty of slots, games and tables from a range of developers, with many progressive jackpots available for real-money players. New mobile players can enjoy a pretty impressive welcome bonus when they join up as well so why not check out the full Rizk Casino review below. There’s actually not too much difference between Rizk’s mobile and desktop clients. The iOS and Android clients work via a straight log-in in your web browser so there’s no need to download an app. The mobile site is split into several no-nonsense categories: Games, Providers, Live Chat, and the ‘Rizk Insider’ blog. You can also get easy access to a ‘Wheel of Rizk’ bonus (see below) which gives you a chance of bagging a big win just by playing your favourite games. Even on our small Android screen, we found the Rizk Casino website easy to navigate. Depositing was a breeze, and the Live Chat support simple to find and use. New players at Rizk Casino can enjoy a welcome bonus worth 100% up to £100 and also 50 extra spins. While the 45x wagering requirement is pretty hefty, most slots are eligible for the bonus. 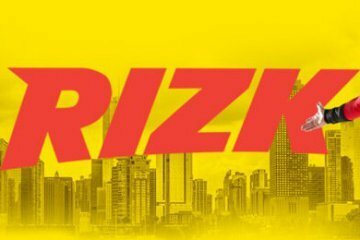 As well as a simple deposit bonus, new mobile Rizk players will get a chance to spin the ‘Wheel of Rizk’ – a prize wheel with cash, bonuses and chips up for grabs. For regular players, the more games you play the more of the ‘Power Bar’ you’ll fill up. When the bar is full, you can spin the Wheel and take a shot at a random prize. Hit 10 levels and you can spin the Super Wheel of Rizk. Seasonal promotions are the name of the game at Rizk. The ‘Midsummer Night’s Dream’ offer promises players up to 200,000 free spins by working their way up the Wheel of Rizk. Each move up the wheel earns players 10 spins. If you’ve played on Rizk’s online site you won’t notice too much difference between the desktop and mobile clients. Slots and games are split into handy categories like Latest Releases, Captain Rizk’s Picks, Featured Games and even ‘English Favourites’. With well over 100 games available, however, the selection is much bigger than at many mobile casinos. Jackpot slots players only have four titles to choose from – Mega Fortune, Mega Moolah, Major Millions, and Treasure Nile – which comes way under the selection offered on the online client. However, with two of the biggest on the net, there aren’t too many complaints. First, the good news: Rizk Casino allows real-money deposits via card, e-Wallet or Bank Transfer. Withdrawals are quick too, generally taking 1-3 business days for VISA cards. The bad news, however, is that there are some fees attached to some payment methods. MasterCard deposits incur a 2.5% fee, as well as all VISA card deposits. There are no fees attached if you use a voucher or e-Wallet. ALL withdrawal methods have a £2.50 fee attached, even methods like Skrill or NETELLER which traditionally don’t have fees attached. If you’re a slots player who likes a spread of developers, you’ll love Rizk Casino. Captain Rizk brings a little humanity to what can be a cold site, and the Wheel of Rizk bonus has plenty of appeal to real-money players. Use your tablet or smartphone today to earn a fantastic welcome bonus today. There’s a tonne of cash up for grabs if you pick the right games.